Today Waitrose has launched its new website. Costing £10 million pounds, we have to ask, what does it do? That is a lot of money, in developer hours it is like employing about 150 people full time for 1 year. So, lets look at the new Waitrose site. First, SEO. Good to see that they have some nice site links on Google, and that Google has cached the homepage today – “9 Mar 2011 10:40:19 GMT”. So the design has not resulted in it being ignored by the big G. That is all on the SEO of Waitrose for now (ooh, added a bit at the bottom). Lets take a look at the site. The site certainly looks good. Clean design, good navigation, good usability, colourful and vibrant images, nice use of images for navigation, big UK chef name dropping (Heston, see the celebrity factor is good for most businesses). Their community looks like it is set to develop. They are now running the Waitrose Cookery School and have links to their mother company, John Lewis. I mention this only because these are things which could be easily lost, but are brought to the front well without getting in the way of the main message. John Lewis was in the news today for its excellent financial results and that John Lewis is rewarding its staff with big bonuses. What else is good? The top feature image rotates nicely to display offers and services, such as its Brand Price Match, Spring Savings and Recipes from top chefs like Heston Blumenthal. I wonder if Heston’s burger recipe is on the site now? Oh, I see Delia is on there too. 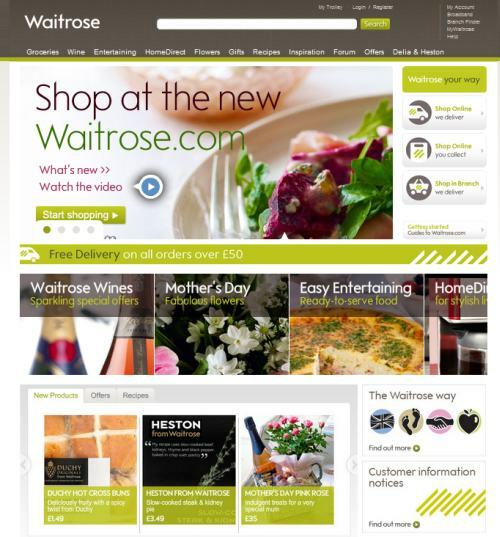 At the top right are some customer links, such as “My Account” and “MyWaitrose”. One that caught my attention is Broadband. Waitrose have a broadband service that I was not aware of. Interesting. Low bandwidth though, only 5Gb per month, with speeds “up to 8mb”. OK for the average home user I guess, not much good for people like me. Waitrose Top Navigation is Broken in Chrome! OK, the nav looked good, but Waitrose’s £10 million website does not work properly in Chrome, which is the fastest growing browser from Google, the World’s most important traffic source. The drop down is shown in Chrome, but when you attempt to move the mouse it closes again. A common problem in Chrome, but one that a £10m budget should have tested and fixed. If the Waitrose web developers are reading this, then I am using Windows Vista and Chrome ver. 9.0.597.107. Interesting comments. It loads very fast for me, at least the parts I have looked at so far. Ah, just worked out some confusion. Their comments are all upside down. Tip: Read from the bottom! I just signed up and the process was pretty painless. Had to chose one of their few food related avatars though. I chose a piece of sponge cake. Like many other supermarkets Waitrose has its own home shopping department, similar to Tesco really. One interesting thing, some people complained about lack of search, for a moment I could not find a search bar either. But they do have one, a huge bar across the top. Looks like a big white line… maybe that has confused some people? They have not bothered with keywords, which is understandable, but should chose a description that really sells their site in Google. It is a nice site. There must be a huge amount of stuff going on under the hood for a £10 million price tag though, still seems excessive. Waitrose.com be one of the UK’s most expensive websites. I’m sorry I don’t share your enthusiasm, you obviously had a preview before it went ‘live’. The site is a dog. Its painfully slow to load and has been offline all this evening. When it has been up the product listings are much too big and necessitate constant page reloads to display the product. 12 products per page is not great for grocery shopping. From a customer perspective, it may look pretty, but I don’t want to spend all night shopping. I could drive down to the store to do that. As a long term Waitrosedeliver customer who tried the Ocado experience and found their lack of time/journey planning a joke – I am almost pushed to going that route. So much for winning new customers. For 10 million, they should have sorted out the infrastructure and the hosting. For it to fall over day one is crazy. It doesn’t take an expert to figure out what is going wrong, to pay someone that amount of cash and it to nosedive like this is crazy. I hope they’ve got a good contract. I admit, I do not use the site for shopping. I have only ever used Tesco, and they were always good from what I remember. I heard about it on the news today. Amazed a website can cost that much money really, but then I know people that spent £8k on a 50 page information site with not so much as a shopping cart! I too am a long standing Waitrose customer and I spent my entire lunch hour on the phone to Waitrose Customer Services today trying to amend an existing order I have booked for Friday. Good job it was a free phone number. The site is very slow and the browsing is not as easy. One of the reasons I enjoyed using the old site was the fact that it was so quick and easy. With the new site it’s a lot slower especially as you can only view 12 items on a page. I gave up with some of the special offers this afternoon as I couldn’t be bothered to trawl through 23 pages (and slowly). I am very disappointed as I doubt whether I will have time to look at all the lovely products Waitrose sell. Sadly they may lose a customer and I doubt if I will be the only one to shop elsewhere. I am a loyal John Lewis and Waitrose customer, and have had one of the worst on-line experiences ever today on the new Waitrose website – which they never even told us they were launching! Please see below the customer feedback we have given tonight below. We have just had the most unfortunate experience in placing the above order. We started trying to place the order shortly after 9pm tonight, and finally ended now at nearly 10.30pm. Your new website is quite frankly a complete disaster, and we think you should ask for a refund of your £10m investment! Where to begin – firstly you never contacted us to advise us the website was being changed. The first I knew was when I went and logged on tonight, only to end up on a page where I was re-directed. The new page took ages to come up, there are no clear guidance notes on whats different or how to find things like our previously saved lists. I managed to book a delivery slot, only for the website to completely crash for 30 minutes. When I eventually got back on, I had to book the slot all over again. When I then found my list, instead of being able to scroll down the whole of my list and simply select the items I want to order, I now have to scroll through 9 pages! You have a button at the top of the list on each page saying add selected items to trolley, and I went through all my 9 pages and then used this button, only for it to tell me that I have to select something. So the only way the select option works is for me to go through page by page and then select the items on that page only then scroll all the way up again to select the option to add the selected items to trolley. This is not very sensible or user friendly. I was not best pleased that I had to go through my list all over again and select items page by page. Why not have the add selected items to trolley button at the bottom too? We then could not easily find how to navigate to the checkout – eventually we saw the my trolley link in tiny text at the very top of the screen. I am shocked and dismayed that you have discarded a relatively user friendly website, and replaced it with probably the worst shopping site anyone could imagine, Its not intuitive, its not user friendly, and it appears that you have launched something that I cannot imagine passed any decent usability tests. As a customer I’ve gone from probably being able to place an order with you in about 2-5 minutes to one that took me 90 minutes. This is not progress, or customer service. If you do not improve your site quickly, I think you will be losing a further £10m in lost sales, as its probably going to be easier for us to switch to Ocado, as at least their website is relatively user friendly and intuitive. Teething problems are one thing, but this is far more than that, it is as I said, a complete disaster. I hope that you can sort this matter out, but perhaps you would be wiser to revert back to the old site until you can get your programmers to re-think the new site and come up with something more akin to your brand reputation. Finally, one of the items is an offer for Jazz apples where you offer 2 for £3.00. We discover at checkout, that this offer is not reflected in the price, and we have been charged £11.40 instead. Please can you ensure that this is rectified on our order. Does not sound good Andrew. Anyway, what are jazz apples? Is that 2 apples of £11.40? Or is it a name for something that is not related to fruits? As others have pointed out above. The new website is painfully slow and does not work properly on the Chrome browser. It has just crashed again and despite using 2 different internet connections, I can not get the site to load. My delivery slot expires in 5 minutes and I can’t complete my order. Hope this gets sorted out soon! We just had our first experience of the new website. It was not good (major understatement there). I’d echo pretty much everything Andrew Murray said. They should revert to the old website immediately since the new one is clear unfit for purpose (as just about any half-decent testing should have told them). Not to put to fine a point on it, it looks to me like 10 million quids worth of shite. The new website is a disaster! I have been using waitrose Deliver for nearly 2 years and have never had a problem before. It was quick and easy to use. Yesterday I logged on to do my usual shop (had to change my password and re-enter all my details first!) I managed to book a slot but the site was so slow it was unuseable so i lost the delivery slot. I tried again this morning and managed to put in an order, taking at least twice the usual time due to the problems mentioned by other posters on here. Finally made it through to the checkout, after re-entering details AGAIN, only for the whole site to crash. I have now lost the delivery slot once more. I would be leaving these comments on the Waitrose site but I cannot get on to it. I have left comments on the Facebook site but the only answer given is that they are working to solve the problems! For £10 million I would have expected the problems to have been worked out beforehand. Quite honestly, I’m disgusted and disappointed. From the comments I’ve heard, I’m glad that I’m not an online Waitrose customer at the moment. Tesco is my online supermarket and their website has always been reliable for speed, shopping lists, and delivery slots. It would take a lot for me to switch, but I am sucker for any discounts that they could provide me with. The £10 million cost, if it includes hardware and maintenance as well, is probably not too excessive. The development costs were likely to be a very significant part of the cost. The Waitrose website was down when I last looked, so I couldn’t see what technologies they were most likely using and if it’s anything I’m familiar with. Something seems to have gone wrong with their pre go-live testing, or expectations of the site, if Chrome is not a fully supported browser but I’m sure they’ll get it right in time. First impressions always count, so having your website go down, and be slow on launch, must be one of the worst things that could happen to them. It’s not much use having a pretty looking website if your users don’t like using it and supermarket delivery is a very competitive market with only a small selection of providers. Even myself, in my redevelopment of Latestdiscountvouchers.co.uk, looked at Chrome and the overall speed of the website. My development, maintenance, and testing is nothing in comparison to what Waitrose.com will have completed, but similar development and testing principles should still apply. All I can imagine is that there must be some very red faces in the Waitrose.com offices at the moment and hope, for the users sake, that it’s all fixed soon. “Sorry Waitrose.com is temporarily unavailable. We are carrying out essential maintenance work, which we are working hard to complete as soon as possible. We apologise for any inconvenience, please try again later. I wonder if their wine sales will increase this week? Well, their food sales certainly won’t! Btw, I would avoid the Facebook site, any constructive comments seem to be shot down by other members. Their Customer service on the other hand is top-notch! It is amazing how some people will always loyally support a brand even then something has obviously gone wrong. After a number of years of fantastic Waitrose on-line shopping their new web site is a complete disappointment and unless something is urgently changed I and no doubt many other users will have no other option but to go elsewhere because the whole process just takes way too long – seriously disappointed and unimpressed and I have composed an email outlining my grievences but it keeps getting bounced back at the moment… funnily enough!!! Works fine in Chrome over here. Yeah, I noticed that the menu problems I had when I first looked seemed OK. I am sure there are lots of people working away at getting it up to speed. No idea what the last search refers to, I guess a physical event in Norwich, and not the new website! Managed to get my delivery today. Seems as though this new website was three years in the making! There were plans to launch it before Christmas – thank god they saw sense with this one. I feel very sorry for the delivery drivers who must be getting a lot of flack from people, that is if they ever manage to place their orders in the first place. All the time taken to build up the online business could be lost – what a waste. Sorry Waitrose but I’ve been with you for over 8 years. The whole point of online shopping is to save time; from my experience so far it’s useless. Did you actually do any user testing with existing customers, after all we’ve spent the money to allow you to spend £10 million on this? Sainsburys and the other supermarkets must be rubbing their hands with glee. You will be losing my custom; I won’t be changing out of choice but necessity. Share all the feelings of the above. The new website is a total disaster: I have so far wasted two and a half hours over the last three days in three visits. It has taken on average three attempts to get into the site, presumably as all customers are taking four times as long as usual; it fell over on average four times per use. Editing an existing order required some fifteen ‘loading’ intervals, each of them averaging thirty seconds; and the design means that the only logical way to do it is to start at the end and work back. Items are arranged in no sort of order. Adding one item – just one – to a list tonight took eleven minutes. The old site was user-friendly and well-designed. I’ve been a loyal Waitrose on-line customer for nine years; they’d better put it right soon – or, better, bin it. “We are extremely sorry to read of the problems some of you have experienced when you visited our new waitrose.com website. We appreciate this was frustrating and apologise for the disappointment and inconvenience caused. Regrettably, we have experienced some minor teething problems with our new system. However, please be assured that our systems team are actively working on these issues as a matter of urgency to resolve any problems identified. The comments we receive from our customers are extremely valuable in alerting us to any possible shortcomings in our operation. I would like to add that we will be making updates to the new site going forward, as we gather customer feedback, and we appreciate you taking the time to bring your concerns to our attention. We hope that we may regain your confidence in our new website and look forward to your continued custom in the future. As expected, they are on the case. I guess that in the testing environment they could not test volume of traffic, but I am sure that they will be able to fix this soon enough. For the past 5 days I have been unable to access my email on this website. I hadn’t seen any of these claims that they had spent £10 million piunds until I found this article. Frankly if they had spent £10 they would have been ripped off if this is what they got. It only takes a quick look at the forum to see what their customer response is, universal condemnation and demands that they just restore the old web site! It’s all very well praising the site layout and SEO but the simple fact is the new site quite clearly doesn’t work, or at least doesn’t work adequately. It doesn’t matter how well google indexes it if the thing won’t do what it’s meany to. Simply, far too slow to be useful. £10m – presumably, they paid this huge sum to avoid embarrassments such as this. Quite dreadful. Clearly it’s had no usability testing at all, or none by anybody who regularly shops for food on the Internet. I think it’s the worst retail website I’ve ever used. One wonders how they could have got it so wrong. What is going on behind the scenes. Do they realise how bad it is? Are they going to put in place some sort of remediation program and communicate better to their users rather than ignoring them. The absurd ‘teething problems’ email is quite inadequate. 1. Is it just me but I can’t see the bakery anywhere in ‘fridge’, ‘cupboard’, etc. I can only seem to find it if I do a search on ‘bakery’. 2. If you forget that item is already in your trolley and you add more it doesn’t prompt you that the items are already there (like it used to) so unless you check, you could end up with more than you want. 3. If you are amending a saved list, each time you save the page you are on it reverts back to page one and not the page you have just amended. This took me ages to work through; given the time it takes to shop now I’ve had to reduce my saved items to save time when I do an order. Total disaster. It is now 16th March – I can get all the way to Checkout and pay but it then goes in to melt down and comes up with an error. I’m going to have to go to Morrisons tomorrow as can’t get my shopping any other way. Be quicker in the long run as have tried to checkout 10 times without success. Am surprised at the positive review of the website, given the retrograde design in terms of the on-line shopping which has now become a miserable experience. What is more surprising is the slow pace that Waitrose are taking to fix the self-inflicted issues: it’s taken over two weeks just to issue an apology on their website forum “Please accept our sincerest apologies for the problems you have experienced with the new website and thank you to you all for your feedback”. Probably the worst two points in this whole farce are first that Waitrose appear to be ignoring the issue and at best giving a dismissive “it’s just teething problems” answer and secondly and more importantly that they used to have a web site that might not have been updated for three years but it worked very well. They’ve taken away a three year old mercedes and replaced it with a brand new trabant! So I wasn’t alone on this. What is astonishing is that with such a loyal and dedicated user base, they didn’t pick a couple of hundred of us and ask us to trial it. I use it 48 weeks a year and kind of know what works and what doesn’t. I would have done it for a nice bottle of red! This is the worst website above £1m that I have ever seen. Don’t even bother with Waitrose website a complete joke !!! 2 hrs to do part of my shopping. Back to wonderful Tesco for the remaining and all future shops. As of August, 5 months after the launch, the Waitrose website is still unbelievably poor. The search function is laughable – search pizza, it returns lobster bisque and cannelloni, for instance. Technical errors of some kind or another are the norm on each and every shop, not the execption. And it is still sooo slooowwww – each page load takes a few seconds, which amounts to a lot if you are trying to do a browse-the-shelf type shop. And Waitrose just won’t (or can’t) get it sorted. Quite unbelievable. Just look at the Waitrose Forum comments for the disastrous user experience shopping on the their site has become. Website is still unbelievably poor in October. Painfully slow, and just when I was about to check out, the whole thing crashed and I got the same error message as above from months ago. Waste of time. Sorry Waitrose.com is temporarily unavailable. Very strange. Most web designers will update a site on a development server and then after testing all changes move on to the production / live server. This should cause minimal downtime. Why take a site offline for a while day? And on a Sunday before Christmas, when many people are wanting to do their online turkey orders.